Do you want to change diapers on top of your clean bed? N to the O. Your baby’s exploding poop will just ruin the sheets! How about doing it on top of a bathroom counter? Not possible either. If your kid is as energetic as mine, he’ll be on the floor the next second. Also, the bathroom counter is fool of germs. You don't want your kid to get any of it while lying on the counter. So what is the answer to squirmy kids and dirty surfaces? Diaper change times are my least favorite part of the day. It is nasty whether you're using reusable or disposable diapers. But I (and you) have no choice. There was a time when I was doing diaper changes every three hours or so. I had to do it wherever we are, even at the grimmest places out there. Diaper changing tables at public restrooms are the worst! So I decided to look for the best changing pad. What is a changing pad? A changing pad is a small mat (just about as small as your baby) that you use wen you need to cleanup your little one after he pees or poops. It is made from soft materials but it also covered with a vinyl or something similar to prevent leaks all over your bed or any other area. If you are like me, you will only need two diaper changing pads. One is for your daily use at home and the other is for traveling. I like the convenience of strapping my little Houdini into his changing table at home. At least I know that he isn’t getting anywhere. It also frees up my hands to do just about anything twice as fast. Your other diaper changing pad must be portable. It must be small enough to fit into your diaper bag. You might want something that is disposable, but I like mine reusable. The best diaper changing pad must also be worth the money. It must be economical, convenient and hygienic. 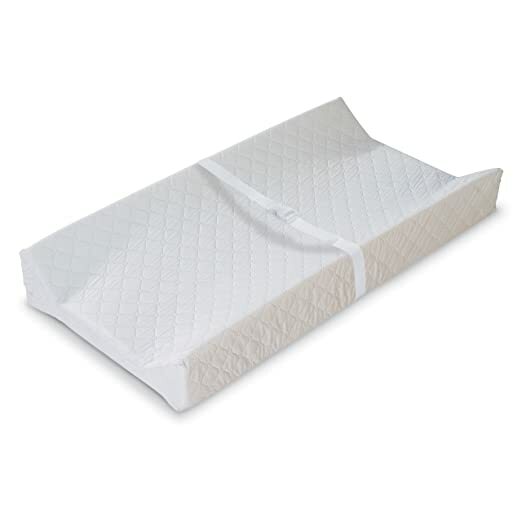 Summer Infant Contoured Changing Pad is the most trusted changing pad on this list. It has all the attributes of the best changing pad with its waterproof safe design and secured straps. I got this one for my first child. Mine has survived a tubful of sanitizers and buckets of poop. Now my youngest is already a toddler, and this changing pad is still standing strong. With its standard size, you can easily find cloth covers in all colors and shapes. It is also waterproof, easy to clean and won’t stain. It has a non-skid bottom but is not as slip-proof as I expect. Suffice it to say that this is the best changing pad for dresser tops although it is not for hard and slippery tiles. Have I also mentioned that this changing pad is one of the cheapest? The Summer Infant is not perfect but is the best value for money in this list. If you are looking for the most secure changing pad and have enough money to spare, then I suggest you check out LA Baby changing pad. True to its name, it is indeed American made with a high-quality feel. All four sides are elevated to create a low-rise wall to keep your baby safe at all sides. Also, rollovers and falling babies are a thing of the past with its 4-inch height and snug straps. The LA Baby 4-sided Changing pad is also one of the best in the market with its waterproof, non-toxic and antimicrobial surface. Just clean it with antibacterial baby wipes and you are done for the day. You can transform just about any surface into a diaper changing area with this changing pad. At 30” in length, LA Baby changing pad is ideal for babies up to 12 months. Its 4-sides elevation is good for keeping kids safe, but it has its disadvantage. If your child is in the 95th percentile, he will immediately become too tall for this pad. That’s just a minor problem, though. In terms of quality, this changing table deserves to be called the best changing pad! Munchkin is the sturdiest changing pad on this list. It won’t move or budge even with a hyperactive baby on top. It grips the dresser top well with its straps while its buckles keep your child in place. It has a smooth surface that you can easily wipe and clean. The material smells plasticky during the first week. You’ve got to air it out for a day or two to reduce the smell. Munchkin changing pad is a bit on the large side, which I appreciate. Other changing pads can only accommodate a baby up to 12 months or so, but this one can fit my little girl at 20 months. Munchkin is snug yet soft; your little one will not have any issues lying on here while you get to clean his bottom. 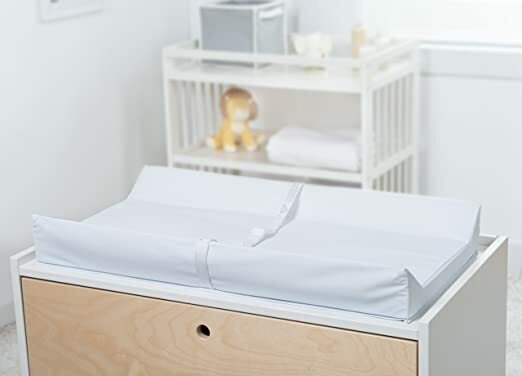 Munchkin Secure Grip fits most changing pad covers; it is also of the right size for most dresser tops. For these reasons, this deserves a spot on our best changing pad list. Our baby’s poops are sometimes like time bombs. You can’t spare another second to get prepared. Hence, you need something lightweight and can fit all your diaper change supplies. Good thing there’s this portable changing pad to save your day. This changing pad is one of the best in its class for its size and material. It folds up nicely and spreads out into a large changing pad. Aside from a changing pad, this model has pockets for some diapers. There’s also a mesh pocket that can hold some baby skin care essentials such as diaper cream, lotion, and sanitizer for mom. There’s even enough space for a change of clothes and a washcloth. There is no need to raid the bag for supplies. Isn't this the best changing pad? 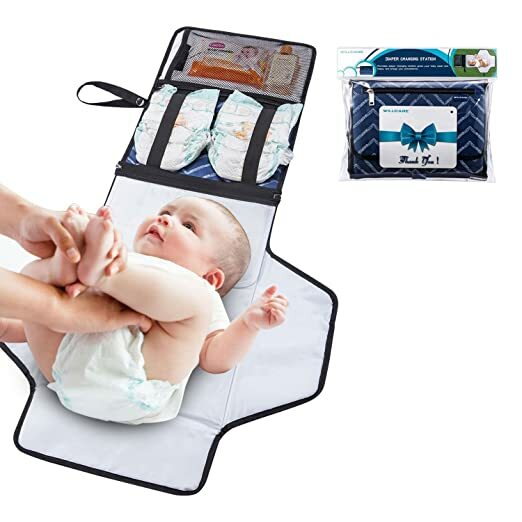 With this portable changing pad, you can pack everything in one go. I find this convenient; especially since I tend to tag along with my baby sans help from any person. Less hassle and less stress! Summer Infant Quickchange is another best changing pad for on-the-go moms. This is the smallest changing pad on this list. Use this anywhere to protect your baby from germs lurking at public washrooms. Tuck this changing pad in your diaper bag; it won’t take up much space and weight. It might be small once folded, but Summer Infant has a nice set of cushions to keep baby comfortable. ...its surface features an impenetrable barrier, making it hygienic and easy to clean. It won’t soak up water and is stain-proof. The downside of Summer Infant Quickchange is its size. This may be the ideal size for infants but can be too small for kids that are ten months of age or older. Notwithstanding that, in terms of comfort and portability, this changing pad is hard to beat. For that, it made its way to the best changing pad list. Before you buy a changing pad, measure out the surface where you are planning to put it. Check its dimensions against the changing mat. Check out the belt and straps. See to it that it has a non-skid bottom and has easy-to-remove buckles. Lastly, check if it is easy to clean and sanitized.